The first thing to say about Dave Irvine is that he's probably one-third a blackjack player, one-third a scientist and one-third a businessman. Also if you have read a book "Bringing Down the House" written by Ben Mezrich, you can get acquainted to the main character - his real name is Dave Irvine. Dave was born in Granger, Indiana, his father was a professor and mother - a school teacher. Dave graduated in 1989 from Penn High School. Later he made one more graduation from Massachusetts Institute of Technology, achieving degree of Bachelor in Science in Mechanical Engineering and already being acquainted to Mike Aponte. This was not enough for his curious and sharp wit, and in 1997 he earned his Master's degree in Cornell University before earning his M.B.A. in 2002 at Purdue University. The right variant of usage would be a blackjack Talent. Because from the very beginning of his participation in MIT team Dave, despite of the fact that he never encountered blackjack in his previous life, incredibly quickly passed through the training period and became a member of the team. Later in his interviews Dave told that it was very easy for him to count cards - and it's in that time when his teammates and an enormous number of average people find it extremely difficult. This way or that, the first trip of Dave Irvine was quite pleasurable - the team during one hour won almost 55.000 $. After that incident Dave says that he was hooked - he was merely astonished at such a pleasant and welcoming and at the same time plain way to earn big money. Dave's place in the team was chosen by himself. He was a back spotter - a player who counts cards precisely while making small bets and when the odds go to the player's benefit - he leaves the game and lets a Big Player to the table to bet big and win hard. Being a Master in Business Irvine, Dave decides to leave big blackjack and take part in his family business - bioengineering. Today Dave works over another project referred to defense of the U.S. from chemical weapons. Also he is a co-founder of Blackjack Institute company along with his friend Mike Aponte, whose works over instructions and services considering winning in blackjack. 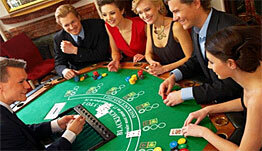 He still contacts with his former team members Johnny Chang and Bill Kaplan on events that concern blackjack.